Are you ready for a new kitchen look? Before answering, first ask yourself if a change in cabinets alone will make a real difference to the overall kitchen decor. It probably will, especially if you consider any of the main methods used to antique cabinets. Revamp your entire kitchen by breathing new life into your out of date cabinets. A number of methods are available for antiquing kitchen cabinets to give them a total new look. Here is a summary of the six top techniques. Antiquing using stain is easiest on light colored cabinets. You’ll want to use a stain that is darker than the existing finish. In most cases it’s best to remain in the same color family but slightly or drastically darker in tone. You need to decide before you start, how you want the finished cabinets to look. Do you want to create a worn look around where the hardware is attached and along the door edges? You would rub out most of the stain in these areas and leave it heavier in others. If you have darker cabinets, you may need to completely refinish the cabinets. This would be a complete refinishing job consisting of sanding, painting, drying, and then later staining. Some woods are darker by nature. In this case, you may prefer to consider painting, then antiquing afterwards. Distressing is another way of giving your kitchen cabinets a totally different look. The distress process can be done on painted cabinets, stained cabinets or on raw wooden cabinets which will then require further refinishing. This is a great look if you want to make your cabinets look aged. The cabinet distressing process involves using simple household tools like a hammer, chisel and hole punch. If you have a few nails or chain lying around, that would be good too. You can strike the cabinet directly with a hammer to give it a worn look, though using a chisel to chip a small piece of wood out or a hole punch to mimic a worm or nail hole is often more effective. Hitting the head of a nail from the side can create interesting effects, and so can a chain. You need to use this technique carefully so as not to damage the cabinet. Use a lighter-weight hammer so you are less likely to strike the cabinet surface too aggressively. A heavy hand can take out pieces of wood larger than intended. If this process is not for you then try an alternative antiquing method. Use sandpaper that is fine to medium grit, and sand the paint in strategic spots. For instance, areas around the handles, the edges of the doors and drawers are places that usually show the most wear. These are the best places to sand. Test on an inconspicuous spot. If cabinets are light in color, it will look best if these areas are naturally darker, or at least a different color. If the cabinet is a darker color, the wood or paint exposed underneath needs to be a different color, preferably lighter to achieve the aged look. You can sand various spots to add to the overall old look that distressing simulates. A stain or sealant will enhance your finished product. 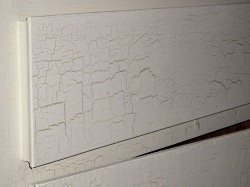 A method called crackle painting is yet another way of antiquing kitchen cabinets. The process requires two or three types of paint, depending on the process you choose. In the typical crackle painting process, a base color would be your first coat, crackle glaze the second coat and a final top coat color. This final coat cracks to create the antiqued or weathered look. Make certain if you are using a water-based crackle paint that your other paint coats are latex. Water based crackle will not adhere to oil based paints. Paint the cabinets the color you chose and once dry. Then apply the crackle glaze according to the manufacturer’s instructions. After that dries, apply the finish coat. This will cause the final top coat of paint to crackle. This method takes a little practice to get the right look. If you plan to use crackle painting to antique your kitchen cabinets, it would be best to practice on a piece of wood before actually applying the paint to your cabinets. One method some people still use to distress cabinets and make them look older is accomplished using wax. Beeswax distressing produces a textured look with the wood or paint underneath showing through, which gives them an antique look. Beeswax is one of the best types to use but tinted wax is also available. Simply apply the wax on the cabinet using a streaking method. 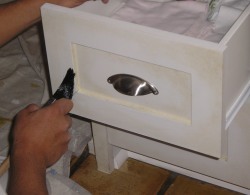 Allow the wax to dry, then place a second coat on the cabinets. Once that’s dry, use medium grade sandpaper to sand away some of the wax which will allow wood to show through. Another choice would be painting over the wax, followed by sanding. This allows the paint to come off more easily, which will expose the original wood underneath. Sanding is the key to how much or how little of the wood you want to show. To use this method, you need to start with unpainted cabinets. If your cabinets are stained or painted, they can be sanded down to the original wood. Depending on the type of wood, a medium to course sandpaper would be used for this step. Apply the paint color of your choice to the cabinets, then wipe it off in random spots before it has time to dry. For this process, latex paint is preferred over oil based paint. This is a simple way of making your cabinets look old, as if they’ve been through years of use. With this method, the antique look can be enhanced by leaving some of the bare wood to showing through. There are so many cabinet antiquing methods to choose from when it comes to giving your kitchen an entirely new look. Designers prefer the antiquing methods, since they work well with many styles. Achieve your desired look by taking time to choose the right method of antiquing for the style of your kitchen and home.